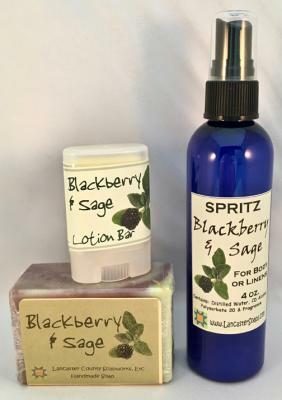 Blackberry & Sage is one of those aromas that is just plain delicious. and it has become a favorite with many of our customers. The full-bodied scent of Blackberry & Sage in a spritz. A moisturizong lotion bar, so fragrant it can be used as a solid perfume. Small enough to carry in pocket or purse. Mellow Berries, with sage added for sophistication. The scent is very fresh - not cloying. A pale green base with muted burgundy swirls. This soap immediately became one of our best sellers.